Frittedda is exclusively Sicilian and is a luscious combination of spring vegetables lightly sautéed and with minimum amount of stirring to preserve the textures and fresh, characteristic flavours of each ingredient — the sweetness of the peas, the slightly bitter taste of the artichokes and the delicate, nutty taste of broad beans. It is really a slightly cooked salad and each vegetable should be young and fresh. In Sicily this dish is usually made at the beginning of spring (Primavera), around the feast day of San Giuseppe (19 March) when the first peas and broad beans come into season. It is thought that the origins of the dish are from around the northwestern part of Sicily (from Palermo to Trapani), but I have also found recipes from the agricultural areas in the centre of Sicily, in Caltanissetta, Enna and across to Agrigento and all have their own variations. Because frittedda is a celebration of spring, I also like to include asparagus, but this is not in traditional recipes. Use white or green asparagus, thick or thin. Yet again breaking with tradition I often add a little strong broth for extra flavour — Sicilians seldom add stock to food and rely on the natural flavours of the ingredients. They know that the sun always shines in Sicily and therefore, their produce tastes better. To fully appreciate the flavour of frittedda, I like to eat it at room temperature (like caponata) and as a separate course — as an antipasto with some good bread. The recipe also makes a good pasta sauce to celebrate spring. Prepare the artichokes – strip off the tough outer leaves. It is difficult to purchase young artichokes in Australia so you may need to remove quite a few of them. Keep the artichokes in acidulated water (use juice of 1 lemon) as you clean them and until you are ready to use. Cut each artichokes into quarters. Slice the artichokes into thin slices. I also use the stalk of the artichoke (stripped of its outer fibrous layer). Add some of the oil. Add the artichokes and sauté them gently for about 5-7 minutes (tossing the pan, rather than stirring and trying not to disturb the ingredients too much). Before proceeding to the next stage, taste the artichokes, and if they need more cooking sprinkle them with about ½ cup of water, cover the saucepan with a lid and stew gently for about 10 minutes. You will know when the artichokes are cooked as there will only be slight resistance when pricked with a fork. Add more oil, the spring onions, the peas and broad beans, salt and pepper. Toss and shake the ingredients around gently to ensure that the vegetables do not stick. Cook for about 5-7 minutes. Add a dash of water (or stock). Add the asparagus and cook for a few minutes longer. Place the ingredients into a bowl or they will keep on cooking. Add the white wine vinegar or the juice of ½ lemon – the small amount of vinegar or lemon juice provides a little acidity in contrast to the sweetness of the dish. You could also add a little sugar. I sometimes add a little grated nutmeg – this accentuates the sweetness of the ingredients. Fresh mint leaves will accentuate the freshness but put them on top the frittedda when you are ready to serve it (mint leaves discolour easily). The Palermitani (from Palermo) add the agro dolce sauce (sweet and sour sauce like when making caponata) made with caramelised sugar and vinegar at the end of cooking. In Enna, in the centre of the island, wild fennel is added during cooking. Around ANZAC DAY in Victoria I go foraging . This is my latest harvest of saffron coloured, pine mushrooms (Lactarius deliciosus), also called saffron milk caps and red pine mushrooms. There are 3k of mushrooms in this bag above. We have eaten some twice already. Below = as a vegetable side dish with Italian pork sausages. And these jars are in my freezer. These mushrooms bruise very easily so I cook them as soon as possible after I have collected them. Unfortunately the mushrooms’ gills when bruised discolour to a very unattractive green-grey tinge. I ignore most of the bruising and cut off the worst bits of the discoloured mushrooms that show too much wear and tear or obvious decay. Most of the time the saffron coloured, pine mushrooms I collect cannot just be wiped clean with a damp cloth and I often have to clean them under softly running water to remove any sand, soil , grass or pine needles. I always completely remove the woody hollow stems because I have often found some bugs harbouring inside the stems. Having said all of this I make them sound as if they are not worth the effort but they are! How do I cook them? …..very simply. I have written about wild mushrooms before. It is autumn in Australia and there are plenty of pumpkins around. I like cooking pumpkin this way because it has unusual flavours and it can be made well in advance. I have presented it both as an antipasto and as an accompaniment to main dishes. I cook this dish quite often and I am surprised that I have not written about it on my blog. 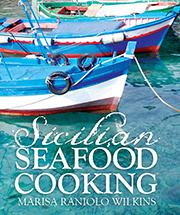 The following text is a condensed version from my first book Sicilian Seafood Cooking. The photograph is also from the book. 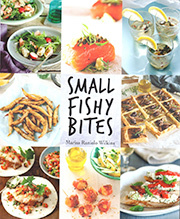 This all took place in my kitchen – I cooked it , Fiona Riggs styled it and Graeme Gillies photographed it. This Sicilian specialty is sometimes called zucca in agro dolce (pumpkin in sweet and sour sauce) but I prefer the more colloquial Sicilian name, ficato ri setti canola – literally, ‘liver of the seven spouts (or reeds)’. It is a colourful and aromatic dish. There is the strong colour of the pumpkin, tinged brown at the edges, and contrasted with bright green mint. The sweetness of the pumpkin is enhanced by the flavours and fragrance of garlic, cinnamon and vinegar. It is better cooked ahead of time – the flavours intensify when left at least overnight, but it can be stored in the fridge for several days. The dish is said to have originated among the poor, in what is known as one of the quartieri svantaggiati (‘disadvantaged suburbs’) of Palermo. Sicilians are colourful characters and like stories. It is said that the pumpkin dish was first cooked and named by the herb vendors of the Piazza Garraffello a small square in Palermo. These were the days before refrigeration and balconies and windowsills were often used to cool and store food, especially overnight. As the story goes, the herb sellers could often smell the aroma of veal liver coming from the balconies of the rich. At home, they cooked pumpkin the same way as the well-to-do cooked liver (fegato) and, wanting to create a bella figura, they hoped the fragrance of their cooking would mislead the neighbours into thinking that they too were well-to-do and could afford to eat liver. The typical way of cooking liver is to slice it thinly, pan-fry it and then caramelise the juices in the pan with sugar and vinegar to make agro dolce (sweet and sour sauce). As for the seven spouts (sette cannoli), they are the short cane-shapedspouts of an elegant 16th-century fountain in the piazza. Below – cathedral in Palermo. In Australia I generally use the butternut or Jap pumpkin,The pumpkin is sliced 1cm (.in) thick and traditionally fried in very hot oil (if thicker, they take too long to cook). Although baking the pumpkin slices is not traditional, I prefer this method .It certainly saves time in the preparation (see variation below). Serve it at room temperature as an antipasto or as a contorno (vegetable side dish). Peel and remove the seeds of the pumpkin and cut into 1cm (in) slices. Peel and slice 4 cloves of garlic. Heat the olive oil in a large heavy-based frying pan. Add the garlic cloves. the pan to caramelise it, and then add the vinegar and cinnamon. Stirring constantly, allow the sauce to thicken slightly as the vinegar evaporates. Add the remaining garlic cloves and few sprigs of mint to the warm sauce. and store in the fridge once cool. Eat at room temperature. leaves on top and in between the slices. Cut the pumpkin into thicker slices, about 2–3cm (1in). Sprinkle with salt and place on an oiled baking tray. instead of a frying pan. I also add fresh bay leaves – like the look and the taste of it. The mint must be fresh. You really cannot beat a plate of grilled vegetables, especially when eggplants and peppers are so prolific at this time of year. Zucchini, although not in this selection are also a good choice. Grilled vegetables are perfect as an antipasto but they can just as easily be part of a main course. The vegetables can be grilled on a BBQ or Grill press or in the oven. To the array, throw in some of the cooked green beans, asparagus or broccolini (that perhaps are left over from the night before), add a drizzle of good extra virgin olive oil, some chopped garlic, a little parsley and a squeeze of lemon juice. You could also add to the cooked vegetables different textures with a bit of crunch – some of that celery, fennel, cucumbers and apples that are probably in your fridge. Or it could be tomatoes, celery, spring onions and fresh basil leaves, once again a drizzle of that good olive oil that will add fragrance as well as taste. Just recently, in two different restaurants I ordered versions of grilled vegetables and they both were presented with Romesco sauce dolloped separately on the side of the vegetables. In one of the restaurant it was grilled asparagus, topped with fried breadcrumbs. In the other it was eggplant. This had been grilled and rather than presenting it in slices it was pulped to a medium texture. Bread is a perfect accompaniment for scooping up the eggplant and the Romesco sauce. A drizzle of good quality extra virgin olive oil is a must. Roast/chargrill the peppers whole, peel, remove seeds and break them into strips. If using fresh tomatoes cut them into pieces. If you are roasting / chargrilling the peppers do them at the same time. *Click on above link to see a list of ingredients and how to make it. This recipe uses hazelnuts instead of almonds. Also the vegetables are roasted. in the oven rather than grilled. Place the tomatoes, peppers and a whole head of garlic in a roasting tray with a little oil and roast in a 190C oven. Take the vegetables out as they become soft, i.e. the tomatoes will take about 10 minutes, the peppers and the garlic could take about 30-40 minutes.. I have just returned from being away over Christmas and New Year and am pleased to find that purslane plants have sprouted in my various pots on my balcony. Purslane (Portulaca oleracea) is a weed in Australia. It grows in many parts of the world including southern Italy and is very much appreciated in various cuisines especially in The Middle East, Greece, Crete and Mexico. I rescued a purslane plant from the roadside last summer and planted it in a pot; it soon grew from a single taproot and formed a large, thick mat of stems and leaves. Throughout hat summer I collected the small, fleshy leaves and the most tender parts of the stem for various salads and I also sprinkled leaves on top of cold soups – this added flavor, texture and colour. The raw leaves are succulent and crisp and have a tart and lemony flavor. Taking notice from some of the Greek traditional recipes I liked them mixed with ingredients such as tomatoes, basil and feta. Recipes are meant to be broken and of course I added my own touches and various ingredients. I also like mixed green leaf salads. Below rocket, purslane, fresh mint leaves, pine nuts, extra olive oil and lemon juice. Towards the end of summer the plant had grown far too large and woody and I pulled it out. It is a seasonal plant and by then the mature plant had obviously scattered its small black seeds in my other pots. I think that if I had a garden I would find Purslane very invasive, hence appropriately called a weed in this part of the world that does not have a long continuous history of foraging. The culture of foraging in Australia has been largely disregarded over the past 200 years. For tens of thousands of years and before European settlers the Aboriginal people foraged native flora and there is also historical evidence pioneers and explorers ate wild greens. Purslane can also be cooked on its own or added to other greens;I rather like the mucilaginous gel-like consistency it adds to food (like Okra) but many people do not. This climbing plant above is growing in one of my friend’s back garden in North Adelaide. (The potted plants below are his too.). The plant is Basella rubra, commonly known as Malabar spinach, Vine spinach or Ceylon spinach. This creeping vine is the variety of Basella with purplish-stems and deep-green leaves with pink veins. Basella is a popular tropical leafy-green vegetable native to south Asia and eaten widely in Asian countries where it is known by a variety of local names, for example and to name a few, it is mostly known as saan choy in China, mong toi in Vietnam, pui saag in parts of India, remayong in Malaysia and alugbati in the Philippines. Like spinach Basella alba and Basella rubra it is a very versatile vegetable. The young leaves can be eaten raw and the larger leaves are cooked and depending on the regional cuisines it can be added to soups, in stir fries, curries etc. Like purslane the leaves are fleshy and thick, they remain crisp and taste of citrus when raw and when cooked the leaves soften and taste slightly mucilaginous. Basella doesn’t wilt as much as spinach. Basella leaves remind me very much of Warrigal Greens. (Tetragonia tetragonioides ) is a leafy groundcover also known as Botany Bay spinach, Cook’s cabbage, kōkihi (in Māori), New Zealand spinach,. Although I have cooked this green many times before I do not have any photos. I cooked the leaves of the Basella alba and sautéed them in extra virgin olive oil with garlic. On this occasion, I wanted a conventional green vegetable side dish to accompany a main of fish. If however, I had wanted to cook them in a Chinese way, I may also add spring onions, fresh ginger, chili, sesame oil, oyster or soy sauce. Maybe for a Japanese recipe I would add mirin or miso. Although I am typecasting some ingredients you will understand what I mean. And would I have fed these vegetables to my mother? No way…. but maybe if I had used some typical way of cooking Italian greens she may begin to appreciate them. Bring a small amount of lightly salted water to boiling Add the greens. Cover the pan and cook until tender or to your liking. Optional: Cook the greens using only the water still clinging to leaves; cover, and cook until wilted, stirring halfway through. Drain the greens well in a colander. Dress with some extra virgin olive oil, adjust the seasoning if necessary (add pepper is optional) and a squeeze of lemon juice. Heat some olive oil, add the garlic, (chillies and the anchovies are optional). Add the vegetables sauté for a few minutes until they begin to wilt. Add white wine (if liquid is needed), cover and cook till softened. (Some cooks pre-cook the greens and then sauté them – this may not be necessary). Optional: chillies to taste, and /or a few anchovies can be added at the same time as the garlic. Soak some currants in a little warm water to plump them (about 10 mins). Drain before using. In a small pan toast pine nuts by tossing them around until light golden. They burn easily, do this quickly. Set aside. Heat some olive oil, add some garlic, add greens and sauté until wilted. If necessary, drain off any liquid. Return the greens to the pan. Add currants and pine nuts and sauté a few minutes more. Optional: add cinnamon or nutmeg and/ or grated lemon peel. Cook in butter instead of oil. I once lived in Adelaide and I successfully grew and cooked sorrel. I used it liberally in hollandaise and egg mayonnaises (wilted or raw and cut very finely). I loved these sauces with asparagus, beans and potatoes. I added young leaves to mixed-leaf salads, cut leaves into chiffonade to decorate and add an intense lemony tang to raw and cooked foods. I added it to soups and braises, fish, veal or pork stews and sautéed it with other vegetables. It was great in frittata, too. Because of its intense, sharp flavour you only need small amounts of leaves and when they’re cooked, the bright green spinach-like leaves melt to a yellow-green, mushy purée. It may not sound appealing but it is. I eat extremely well when I visit South Australia both in restaurants and in homes. During my recent trip I encountered sorrel at three different times at different friends’ houses. I was delighted with a sorrel Granita by one friend in her house in Eden Hills (a suburb of Adelaide). It was presented with a sorbet made of elderflower cordial (she made this), golden caster sugar and water syrup and St Germain elderflower liqueur. what you see in in the photo above are the Granita and sorbet, plus elderflowers (from her garden). These were topped with Prosecco. Amazing! This was not dessert – it was presented as a palate cleanser in between courses. It could easily double up as a dessert- a very simple solution is to pair it with vanilla ice cream rather than an elderflowers sorbet….not every cook is as skilled as this friend. See recipe for the sorrel Granita at end of post. Friends in North Adelaide offered me potato and sorrel soup for lunch. I had enjoyed this before at their house and it can be eaten hot or cold. I also visited friends in Ardrossan (a coastal town on the Yorke Peninsula about 90 minutes from Adelaide) and found red sorrel growing in their garden. This friend presented some of the attractive young leaves in a leafy salad. She also wilts it like spinach and has made a quiche with some of the leaves. I told her I knew nothing about red sorrel. I thought that maybe Bunnings had made a mistake (she found it in the Herbs section of this store). Was it really a culinary herb or an ornamental plant? My friend, now concerned and thinking that she should sue Bunnings found a link on the web, and sure enough, red sorrel leaves are considered edible…. despite my misgivings. The story doesn’t stop there. Now back home in Melbourne I found a small bunch of red sorrel at my regular supplier of green vegetables – Gus and Carmel’s stall in The Queen Victoria Market, called IL FRUTTIVENDOLO . I stored it in the fridge in a container partially filled with water. I store asparagus in the same way. Believe it or not there is a lot of information on the web about sorrel that is considered to be at its best in Spring. There is the French sorrel (Rumex scutatus) with distinctly small, bell-shaped or arrow-shaped leaves; English sorrel (Rumex acetosa) with broader leaves- both of these have leaves with a smooth texture. Red sorrel (Rumex sanguineus) is very attractive and has tapered light green leaves with dark maroon veins and stems. Not surprisingly it is also called Bloody Dock. When cooked, it bleeds like beetroot leaves (which I eat). First discard the bottom tough part of the stalks and then wilt the leaves as you would silver beet or spinach. Both French sorrel and English sorrel are used interchangeably. It is also sold interchangeably and usually just labelled as ‘Sorrel.’ The French variety with the smaller arrow shaped leaves is hard to find . Both sorrels have very similar tastes – the flavour is tangy and pleasantly acidic. This is not surprising as sorrel is related to rhubarb, recognized for its tartness that comes from oxalic acid. Some texts advise to use sorrel sparingly and warn that it can be toxic to animals. The red sorrel has been primarily grown as a decorative foliage but can also be eaten. The taste is not as sharp and sour as the French and English sorrels and the larger leaves are tougher and slightly bitter rather than tangy., however when cooked they do break down considerably. Sorrel has been used as a culinary ingredient by the early Egyptians, Greeks and Romans. It was used during medieval and in Tudor times in England and France and it is still popular in French cuisine. Italians have many words for sorrel. They call it acetosa and acetina, acetosella, ossalina or erba brusca. There are even names for sorrel in dialect. It is known as pan e vin in Friuli, Veneto and Treviso regions. The Sicilians call it aghira e duci or agra e duci. The list of the various regional Italian names for sorrel can be found on a site by the Dipartimento di Scienze della Vita, Università di Trieste. The culinary uses in Italian cuisine suggested in the texts that I have seen are the same as in other cuisines: the young leaves are served raw in salads and the cooked leaves accompany fish, meat or eggs and in cream sauces and soups. Sorrel is also found in some Asian cuisines for example in Vietnam it is known as rau chua (sour herb) or rau thom. It is not surprising that in Vietnamese it translates as sour herb – from old French surele, from sur, sour. I had one quick look for a Vietnamese recipe that uses sorrel and ‘sour soup’ seems to be popular. Notice that my bunch is just called ‘Sorrel’. So unfair for those who are not familiar with the other sorrels! And what did I do with my small bunch of red sorrel? There were no leaves in the bunch that I considered ‘small’ so I did not add them to a salad. I added the leaves to some hot extra virgin olive oil and garlic, added the leaves and wilted them. I then added some cooked Puy lentils. I was pleased with the results and presented and made a nice accompaniment to fish cooked with with tarragon and vermouth , cauliflower and baked tomatoes. Equal weight of French sorrel leaves (with that lovely sour taste) and simple syrup (equal parts sugar and water). The sorrel must not be cooked. Just blitz the leaves with the syrup and then strain through a fine strainer. Add a squeeze of lime juice and a pinch of salt to taste and then pour into a container and put in the freezer. About every 30 mins or so I stir it to move the ice crystals that evenly through it. When it is completely frozen (and it isn’t rock hard anyway) I just scrape it with a fork to break it into crystals. Depending on the variety of globe artichokes, they may have green, violet or bronze coloured leaves. In Melbourne it is mid October and the ‘Green Globe’ variety of artichoke is close to being out of season. However, notice that the head is still tight, heavy and compact. Fortunately for me, the green artichoke did not have a hairy choke, but in the next few weeks if you are purchasing the green variety, it is likely to have a hairy choke. Young and in season artichokes do not have chokes or may have a small choke that can be removed quite easily. The hairy, inedible choke becomes prominent when artichokes are going out of season and are left to mature on the plant; the hairy part becomes part of the seed body of the artichoke. The violet tinged variety has been available from my favourite vegetable stall in the Queen Victoria Market for the last few weeks and will continue to be in season for a few more weeks, but as long as the weather doesn’t get too hot. The spiny leaf tips can be prickly so I am always more careful when I clean the violet ones. The green artichokes are at their best in autumn. When I purchase any variety of artichokes I always select artichokes that are compact and avoid opened out artichokes with curled or dry looking leaves. Once stripped of its outer fibrous cover, the top of the stem, is very tender and tasty. Stuffed artichokes should always be upright in the saucepan and have the cooking liquid three quarter -way up. Sometimes I cook potatoes with artichokes to prop them upright. When artichokes are in season, I obviously cannot get enough of them. Red cabbage, sautéed or braised with apple, red wine vinegar, juniper berries, caraway seeds and cloves is the most common way I cook it in my kitchen. Sometimes I add walnuts and at other times some raw bacon – all delicious, but same old, same as. Shredded red cabbage is also good uncooked in a salad, especially with strong flavours – black olives, garlic, red wine vinegar and anchovies – and these ingredients can be used in both a salad and a cooked version of red cabbage. Red cabbage sliced thinly, extra virgin olive oil, red wine vinegar, salt, pepper, bay leaves, lemon and pitted black olives and anchovies to taste ( I like both anchovies and black olives and add generous amounts of both). Make this salad about 2 hours before serving. Place the shredded or finely cut red cabbage into a bowl that has a lid. Mix chopped garlic with chopped anchovies, plenty of extra virgin olive oil, freshly ground black pepper, a little salt (olives and anchovies will be salty), bay leaves and red wine vinegar. Add this to the cabbage and mix well. Leave it to marinate so flavours can infuse. Drain the red cabbage if there are excessive juices. Taste it and add a little more oil and a little lemon juice if it needs it. Add black olives and grated lemon peel and serve. If you would like a bit of green, slice some spring onions and sprinkle on top. In a heavy based saucepan heat a few tablespoons of oil, add the chopped garlic with chopped anchovies- the anchovies will dissolve in the heat. Add the cabbage, salt and pepper and sauté for a few minutes to soften the cabbage. Add the vinegar, bay leaves and black olives and stir through. Cover and cook on low heat until it is softened and cooked to your liking. If it is too dry add a little water or red wine while it is cooking. When it is cooked add the juice of one lemon, mix and serve. Although these recipes have southern Italian flavours, red cabbage can be difficult to find in southern Italy and is far more common in the north. Below is one of Georgia O’Keeffe’s paintings of petunias – these vibrant colours are almost identical of the colours of red cabbage. Mountains of eggplants, peppers, celery, onion, capers and green olives…..a few red tomatoes, pine nuts, basil and the characteristic caramelized sugar and vinegar to deglaze the pan that makes the agro – dolce sauce for caponata. Two days before Christmas and the caponata needs to be made so that the flavours mellow. In a couple of days it will be perfect! Ready for more fresh basil and pine-nuts and ready to be presented to guests. The first lot will be on Christmas eve – it will be served as the antipasto without any other food, just a little, good quality, fresh bread for those who wish to mop up the juices. Caponata Siciliana (Catanese – Caponata As Made in Catania). This one contains peppers (capsicums). Fennel Caponata (Sicilian Sweet and Sour Method for Preparing Certain Vegetables).